Take the chilies, peanuts, dried shrimp and garlic and pound roughly in a mortar and pestle or process very briefly in a blender. The mixture should be coarse, not smooth. 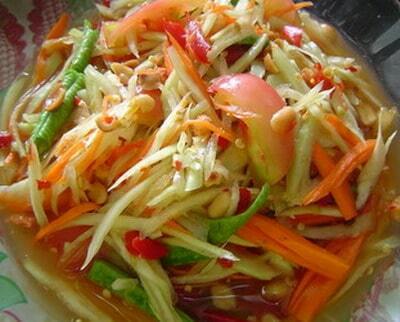 Combine mixture in a bowl with the shredded papaya, bean and tomato. Mix well and add the lime juice, palm sugar and fish sauce. Serve accompanied by other row vegetables (cabbage, water spinach, broccoli or asparagus) and and sprigs of Thai basil. For a complete meal, add glutinous rice and Barbecued Chicken. Prepare the salad immediately before serving, otherwise the papaya will lose it firm texture.